Today, Insomniac announced the return of Beyond Wonderland to the NOS Events Center in Southern California for a wanderlust two-day event. On Friday, March 22 and Saturday, March 23, Headliners will adventure back down the rabbit hole into a vivid world of color and magic inspired by the whimsical story of Alice in Wonderland. Theatrical performers and dancers, accompanied by the secrets of Wonderland, will illuminate the night sky as more than 60 artists bring Headliners on a musical journey across four wondrous stages. Tickets to explore the fantastical world of Beyond Wonderland go on sale on Friday, Jan. 11 at 10 a.m. PT at BeyondWonderland.com. 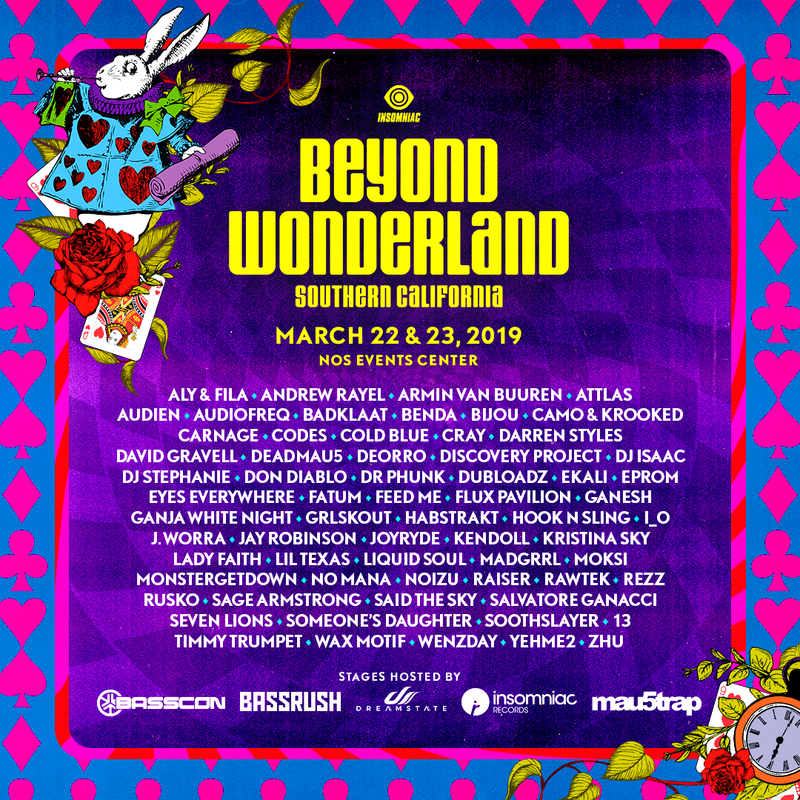 The exceptional lineup of artists set to perform at Beyond Wonderland SoCal 2019 features an extensive collection of genres including house, techno, bass, hardstyle and trance. Across four larger-than-life stages, the Queen’s Domain, Mad Hatter’s Castle, Caterpillar’s Garden, and Cheshire Woods, REZZ, Deadmau5, Zhu, Flux Pavilion, Armin Van Buuren, Seven Lions, Darren Styles, Andrew Rayel and Wax Motif, among others, will give performances beyond compare. Stage hosts, exploring the curious sounds of this surreal adventure, include Bassrush, Basscon, Dreamstate, Insomniac Records, and for the first time ever, Deadmau5’ Mau5trap label. With beats spanning beyond the stages, Headliners will also become fully immersed into the magic of Wonderland with exclusive art car sets.